NIH, CDC funded study finds many in both groups quickly develop kidney, nerve, eye diseases. 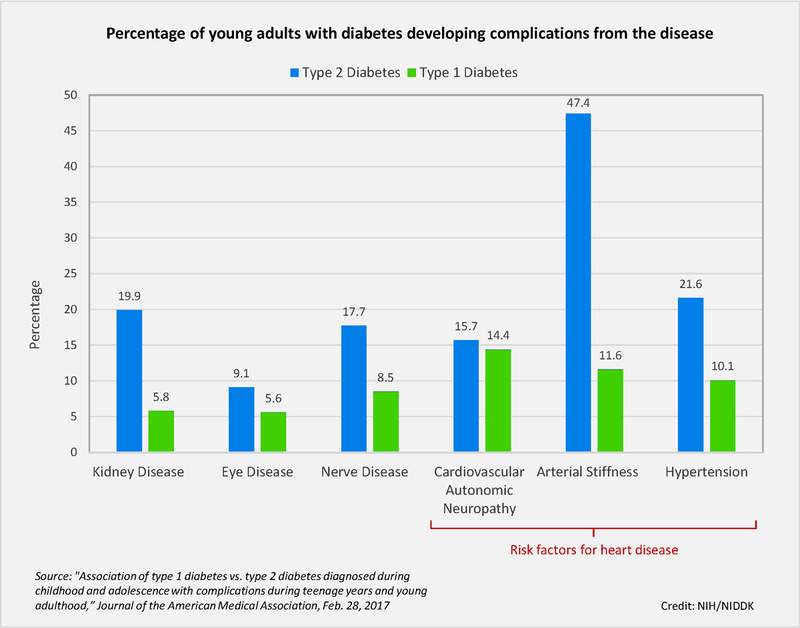 Percentage of young adults with diabetes developing complications from the disease. Teens and young adults with type 2 diabetes develop kidney, nerve, and eye diseases – as well as some risk factors for heart disease – more often than their peers with type 1 diabetes in the years shortly after diagnosis. The results are the latest findings of the SEARCH for Diabetes in Youth study, published Feb. 28 in the Journal of the American Medical Association. Video of What is Diabetes? SEARCH examined 1,746 youth with type 1 diabetes (averaging about 18 years old) and 272 with type 2 diabetes (average age about 22) between 2002-2015. All were diagnosed before age 20. Youth were identified at five clinical centers – Kaiser Permanente Southern California in Pasadena, University of Colorado in Denver, Cincinnati Children’s Hospital Medical Center, University of North Carolina at Chapel Hill, and Seattle Children’s Hospital. Wake Forest University in Winston-Salem, North Carolina, served as coordinating center. Type 1 diabetes typically develops in young people. In type 1, the body does not make insulin, a hormone needed to live. In type 2 diabetes, the body does not make enough insulin or does not use insulin well. In the past, type 2 diabetes was extremely rare in youth, but occurrences have risen alongside the obesity epidemic. Find health information on diabetes at https://www.niddk.nih.gov/health-information/diabetes.